Even though most IT professionals surveyed aren't planning to change employers, they are not optimistic about the long-term IT career outlook. When asked to describe the mood of their IT department, 26% of respondents described it as optimistic, in contrast to 34% reporting pessimistic. The remaining 40% had neutral feelings. This marks a slight change from last year, where 32% of respondents described the mood of their IT department as optimistic and 26% said pessimistic. What is causing application development design workers to have such a gloomy IT career outlook? Of those who don't see the glass as half full, 56% indicated limited career advancement for their sentiments. Nearly half indicated that management was the problem, while one-quarter pegged limited training as the root of the problem. 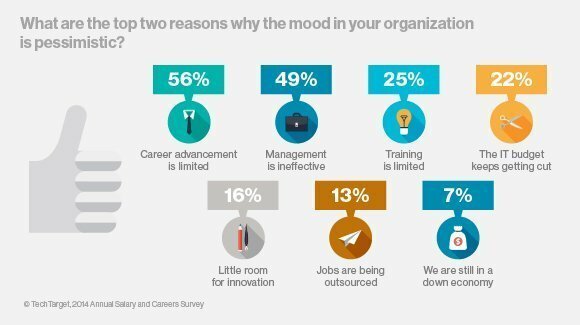 Similarly, poor career opportunities and management were the two leading factors for pessimism chosen by respondents last year. The key to having workers with a positive IT career outlook may stem back to the type of environment management cultivates. Of those who said they were optimistic about the future, 52% said it was because innovation is encouraged. Another 31% said having a strong management team and 19% highlighted increased training as reasons for their upbeat perspective. Not surprisingly, good economic conditions also play a part in IT career outlook, with 45% citing an uptick in business as a reason to be optimistic. Similarly, these were the top reasons last year's survey respondents said they were optimistic about the future. What the future holds appears to be up in the air. Thirty-six percent of respondents predicted the mood in 2015 will be more optimistic in their IT department, compared to 28% predicting it will be less and 36% saying neither way. Why are you optimistic or pessimistic about the future? I'd say i'm more pessimistic. Mostly because I see a lot more outsourcing of code development to other countries. I have worked on code developed by other and it's not pretty nor well documented. If companies are putting their bottom line into this, I can see problems in their future. Thanks for your comment, Todd. Yes, outsourcing of work is definitely a reason to be pessimistic! I think it's a mixed bag, really. I think that "automation" and the promises it makes will inspire some to look for the quickest easiest bucks possible, and there will be a bit of a race to the bottom. Having said that, I also believe that those who show activism in their craft, get involved in initiatives and develop their reputation by doing these things, they will likely have fewer issues with this "race to the bottom" mentality. I also think that those who are willing to work for smaller organizations will have better opportunities, even if those opportunities do not have the same promise of long term "stability". So I shall say that I am guardedly optimistic ;). Thanks for sharing your perspective, Michael. You bring to light another side of the situation that is important to keep in mind. Maxine, I decided to go a little more in depth with my answer. Thanks for the inspiration :). Awesome article, Michael. I am sure many people will benefit from your in-depth response. It's interesting that you and Todd mention outsourcing. Perhaps a good idea for a future article! Not only outsourcing to other countries, but sub-contracting work localy can be an issue. A friend recently was telling me his company has been going flat out with projects. Working weekends and 10-12 hour days. One of their sites was designed by an outside source, before his time and needed some simple mods. The company was contracted again for the simple mods they did not have the time to do themselves. When he got the bill, he almost fainted. For the price we could have hired an entry level person for 1 year, it was over 45,000 !! Wow, Todd. That is a crazy amount of money! I'd say I'm not really optimistic. I'm a young graduate in Telecom with no experience, who just moved to the US from Ghana West Africa, looking forward to continue with my studies. The reason I'm not optimistic is that it is difficult for find a job in my field here mostly because I have no experience. How can I have the experience if no one wants to hire me? Kodzo1, when you are early in your career, you have to get a little more creative to fill in areas. Consider contacting smaller companies, perhaps even non-profits, so that you can get some experience and they can get some much needed help. The pay may not be great, but it's a very good learning ground. Start a professional blog to share what you learn and discover. Get involved with initiatives that will expose you to a broader community in your chosen area. Contact a number of temporary agencies and hit them up frequently. These are not easy options, but I think you will find they can be a huge differentiator for a newcomer to a field compared to those who just have an education but choose not to go the extra mile. Anyway, something to consider :). Hi Kodzo, I know what you are going through. I struggled to get my career off the ground as well. I think Michael in the post above offers some sound advice. When you are just starting out, take a position that is offered, even if the pay is below what you think is appropriate. The job/salary isn't forever, but it will be a resume builder. Also, consider taking on internships, etc. Thanks a lot for the advises @Michael @Maxine really appreciate it. I think an internship will be a good start and also i ll have to upgrade my skills with some certifications..